Award-Winning Periodontist Dr. Sanda Moldovan's Orasana now offers Oral Probiotics for kids to fight cavities and promote optimum oral health. Orasana® announces the release of the Wildberry Chewable Probiotics for kids to help fight cavities, which are the most common chronic disease in children. Orasana® Wildberry Chewable Probiotics were formulated with scientifically studied beneficial bacterial strains to promote healthy teeth, gums, throat & sinuses, help with bad breath, and reduce plaque. Orasana®'s Founder is award-winning periodontist, nutritionist, and oral health expert, Dr. Sanda Moldovan. The Wildberry Chewable probiotics are vegan-certified, gluten-free, soy-free, non-GMO, free from preservatives, free from harmful chemicals, and sugar free. "When it comes to cavities, sugar is the culprit. Sugar causes the growth of a certain bacteria which is involved in the forming of cavities" Says Dr. Sanda. "The Wildberry Chewable Probiotics are naturally sweetened with xylitol so children can satisfy their sugar cravings and prevent cavities at the same time". Additionally, the probiotics can also benefit the child's microbiome as well as the ears, nose and throat. 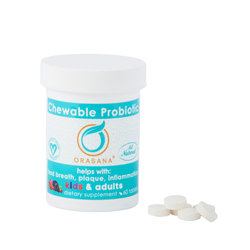 The Orasana® Wildberry Chewable Probiotics dissolve on the tongue, helping attack the bad bacteria responsible for oral health dangers and are are safe to take anytime day or night. The Orasana® health care brand is an eco friendly and all natural company, motivating people to use natural products while educating them in the connection between oral health and the overall health of the body. Orasana® products consist of probiotics, a waterjet flosser, and a biodegradable bamboo tooth brush. Orasana® products are dentist formulated by board-certified periodontist and nutritionist Dr. Sanda Moldovan who says, "your mouth is the gateway to your health." As the developer of the Orasana® product line, she continues to make significant advancements in overall wellness by helping others to achieve optimum oral health with probiotic supplements, and home dental care products for adults and children. Dr. Sanda is passionate about producing all natural, safe and healthy products vital for improving overall health and wellness. Dr. Sanda is recognized internationally for her expertise in oral health, nutrition, and anti-aging. With two Board certifications - Periodontics and Nutrition - she brings as uncommon level of well-rounded knowledge to biological dentistry. Dr. Sanda Moldovan is the founder of Beverly Hills Dental Health and Wellness, and a world-renowned oral health and wellness expert. She tirelessly advocates non-narcotic alternatives for healing, which is the subject of her book, Heal Up! Seven Ways to Faster Healing and Optimum Health, (Advantage / Forbes Books, September 2018). Dr. Sanda Moldovan frequently appears on the Emmy-winning television show, “The Doctors”, as well as guest spots on “Inside Edition,” and NBC News as one of the nation’s leading advocates for nutritional and homeopathic support for oral health and healing. She has authored articles for numerous scientific journals and contributed to major mainstream publications such as Reader’s Digest, Livestrong, Prevention, Men’s Health, The Dallas Morning News, The Huffington Post, Life Extension, and Well Being Journal.